Now that you’re grown, you don’t have to dig around or smash rocks to find treasure. There are professionals who do the dirty work, and now treasure can be installed right there in your kitchen – beautiful shiny rich Quartz countertops. And they’re more than just a pretty (sur)-face. To many who’ve had them installed, they rock…(pun intended). 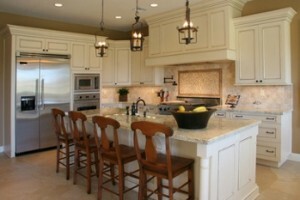 Engineered Quartz countertops have become extremely popular in kitchens for reasons well-deserved. They’re made of approximately 95% quartz and 5% polymer resins and pigments. In its natural form, quartz is less durable than granite, but after the engineering process, quartz countertops have been known to beat out granite on the durability factor. Quartz is strong – In case you missed our previous mention above (you scanner, you! ), quartz countertops are engineered to be extremely durable and scratch resistant. Non-porous – Engineered quartz is sanitary and won’t hold bacteria. Because it’s non-porous, it doesn’t stain easily. Low maintenance – Even if you’re high-maintenance, these tops aren’t. They don’t require the sealing that granite and marble do, and can be simply cleaned with mild soap and warm water. Color/pattern variety – Quartz countertops come in a wide variety of colors and patterns and have been manufactured to mimic granite and marble slabs. Whatever your home style, there’s a quartz top to compliment. With all those pros, there’s not much left to the cons category. The main negative that arises with regards to quartz countertops is their price point. The numbers fluctuate, but quartz tops are typically considered a more expensive option – comparable to granite. Another con is heat resistance (although they’re heat-resistant, they can be affected by high heat). And lastly, seams (they’re manufactured in uniform sizes, so your top may require a seam in certain areas). When it comes down to choosing, quartz tops should definitely be a contender in your kitchen countertop remodel. It all comes down to personal preference, but if you have any additional questions, ask your local kitchen dealer what they recommend – they may even have something better in mind.